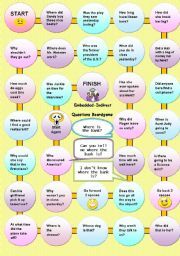 A simple fully editable (Thank you Zailda) present perfect board game, easy questions to make students talk about their experiences... You can change any question if you want to suit your needs. Thanks to Zailda for the template!!! 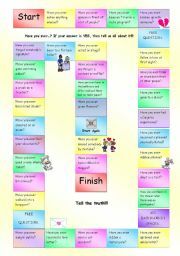 This is a worsheet that I created (with one of Zailda´s nice template) to practice Indirect Questions. Please note that some of them (actually 2 of them) do not suffer any change. Hope you like it!!! A fun boardgame about movies and some role play activities. It keeps them talking and talking. Hope you like it. And THANKS SO MUCH TO jecika´s TEMPLATE. Feel free to edit the questions!!! Guess the Number They´re Thinking Of! A game with cards you can use to have fun in class with the numbers. You will be able to tell them which number they thought of immediately!!! You can review the numbers... It´s fun!!! Let them guess also how you do it!!! INSTRUCTIONS ON THE LAST PAGE!!! 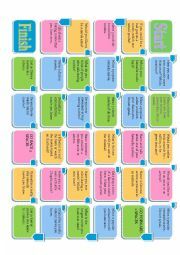 Small and practical board game to make students practice the use of the tenses by making sentences with verbs given. It can be used to reinforce the use of Present and Past tenses. A small presentation with the 10 most common phobias and some celebrities we all know that suffer from them. Ideal for a discussion in the classroom about this strange phenomena. A short presentation containing information about the famous Roswell controversy to create discussion among students and ask for their opinion.